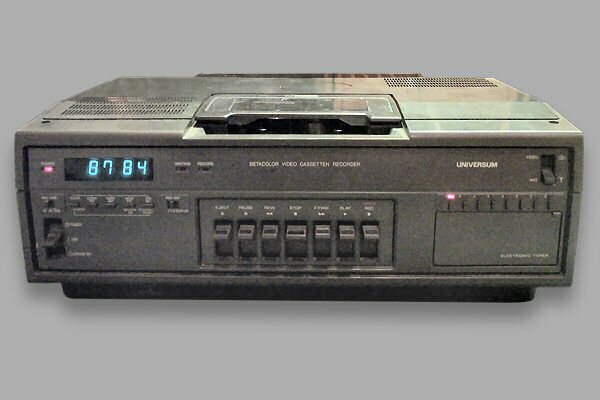 Rear view The Universum VTR-10300 is a top loading clone from an early Sanyo-Model. This was marketed in Germany using the name Universum being a brand of the Quelle company. This is a mail order company selling a full range of goods such as clothing but also including TV, Video and Hi-Fi equipment. Interestingly, on top of the cassette loader is a Beta Color logo instead of the more usual BetaCord logo. 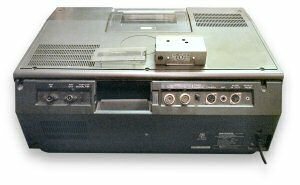 The model features a coloured still function and also an 8-channel tuner. This is configured using manual presets under a panel on the front right of the machine. 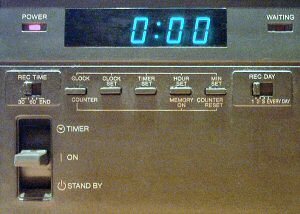 The tuner's AFT switch can only be enabled by closing the door, there is no manual switch for it. Note also the rec time / rec day switches. The rec time switch allowing 30,60 or End with the rec day switch allowing 1,2,3 or Every day selections. 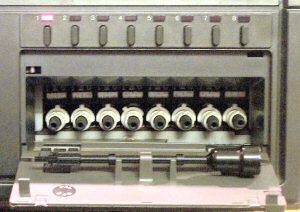 On the rear of the machine can be seen a fairly unique feature, that of a changeable tuner modulator. This would allow the unit to be easily modified for use in other countries. Video connections are made using the older UHF style connectors, There is also a tuner / camera switch allowing connection to a 6 pin camera DIN socket. Also present are a microphone socket, 5 pin audio DIN socket and a remote pause connector allowing synchronised recording for use when in a duplicator bank.